For most of my life, I have been afraid of swimming in the ocean. Maybe it was the giant wave that sent my six-year-old self tumbling head over heels through the surf, maybe it was the stingray I almost stepped on in middle school, or maybe it was that time one of my high school “friends”–knowing I was afraid–decided to freak me by grabbing my ankles while I was standing chest-deep in the murky waters of the gulf. Whatever it was, I eventually decided that the ocean was someone (or something) else’s home, and I knew what I’d do if someone invaded my home. Years later, and after much coaxing, I took a few, shallow steps into the water again. Slowly, I even began to enjoy the experience–jumping in the waves and chasing them to the shore. That enjoyment turned into an unbridled love when I took my first trip to the Bahamas last year. In the crystal clearness of the water in front of our Nassau hotel, I could see what was around me. I discovered that my fear wasn’t caused by the fact that I knew things lived in the ocean; it’s that I couldn’t see them. But in those crystal waters, I watched with awe as sea turtles glided across the bed of seaweed just steps from the shoreline in front of our hotel. I floated silently as two stingrays swam several feet in front of me. I was captivated by the eel and lobster that hung out at the rocks far beyond the shoreline. I couldn’t get enough of it. And so it came to pass on that trip that I signed up for a snorkeling excursion. I donned a wetsuit so I wouldn’t get sunburned, grabbed flippers and snorkels and boarded a boat with around 12 other people. There would be three stops, the brochure said; the last providing the opportunity to swim with sharks. That last one was optional, it said. No way, I thought. Two stops later–two magical hours of riding out into the sea, swimming above reefs filled with fish and sea life, I started to warm up to the idea. I spent most of the way to the third stop peppering the guides with questions and doing a cost-benefit analysis in my head. But I imagined it would be much like our swim with the dolphins the day before–that we would enter a protected cove and be with sharks who were used to being around humans. But then the boat stopped. In the middle of the ocean. There was no land in sight, no cozy cove in which to swim. The instructions were as clear as the sea: We would get in the water in a single file line, holding on to a yellow rope they had floating behind the boat. They would drop a bait box down to the bottom, and then the sharks would come. The guides said the sharks would be more interested in what was in the box and not what was on the surface. Still, they warned, we should not splash or make sudden moves. And we would only be able to stay in the water a short while, 5-7 minutes at the most. By then, it was too late. Drunk on the adventure of the previous two stops (and lots and lots of seawater), I found myself slipping on my flippers–much to my surprise. Let’s go, I said. You only live once. Into the water we went. Down went the bait box. I could feel my heart beating through my wetsuit. And then, the sharks came. Wild sharks. And lots of them. It was, in a word, breathtaking. Ranging in size between 3 – 7 feet, they swarmed on the bottom of the ocean floor. I floated there, holding on to that yellow rope, captivated yet again by the amazing ecosystem that is the ocean. Five minutes felt like forever. I’ll admit that as we made our way back on to the boat, one by one in our single-file line, I wondered if people were splashing too much, so I kept a close watch on the sharks below until it was my turn to board. The whole way back to the island, I sat on the side of the boat, soaking in everything that had happened, staring wondrously out to sea, feeling the spray of the ocean on my face. I felt alive–more alive than I ever had. On that day, I conquered a long-held fear in a big, big way. It is a little trite to think that my decision was based on the cliched phrase that you only live once, but I am reminded of something one of my writing teachers once told me: it’s not that cliches are wrong; they are, in fact, true most of the time. They just make for bad writing. That may be true. But some cliches, like “you only life once,” are great in real life. The company we used for our snorkeling tour was Stuart Cove’s in Nassau, and I highly recommend them if you’re in the area. Wow! Good for you for overcoming your fear. The ocean is such an amazing place, and the ocean in the Bahamas is even more so. Love the fact that you can see the bottom even when the ocean is dozens of feet deep! My husband, who’s a SCUBA diver, always said that if he saw sharks during diving, it might put him off. But he ended up doing the Stuart Cove’s shark dive, and found it fascinating. 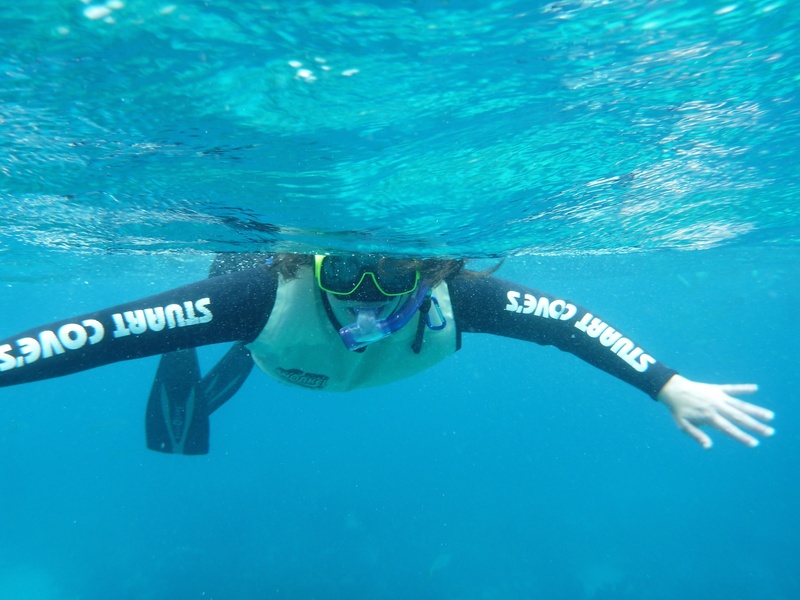 Now, he says, seeing sharks during SCUBA dives doesn’t bother him at all… If you want to do more ocean exploring, I’d suggest venturing out from Nassau to Abaco or the Exumas, or some of the other out islands. Even more amazing underwater sights to see!